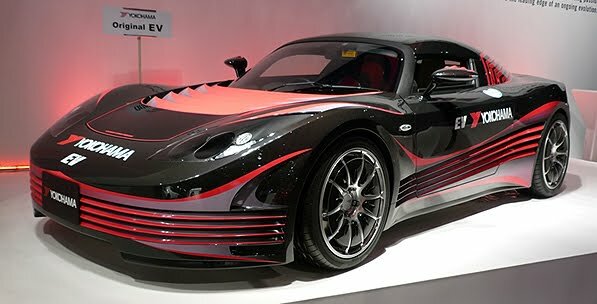 The Yokohama Rubber Co., Ltd., today announced that it first presented the "AERO-Y" that is the company’s conceptual electric vehicle (EV) at the Tokyo Auto Salon 2013 with NAPAC being held in Japan from January 11, 2013. The "AERO-Y" has been designed for the research and development of YOKOHAMA proprietary technologies. YOKOHAMA created the "AERO-Y" by using the company’s environment-friendly technologies in every aspect for the growth of EV motorization in the future. It is a conceptual car manufactured based on the company’s desire to make users feel intuitive sense of "pleasure of driving". In developing the "AERO-Y", YOKOHAMA focused on "aerodynamic drag reduction" as the theme and intensively utilized its latest technologies cultivated at various divisions through the aerodynamics-based designing of tires and bodies and the development of aerospace products and HAMATITE adhesives and sealants. In designing the "AERO-Y" body, MOONCRAFT.CO., LTD. represented by Mr. Takuya Yura*, a racing car designer, cooperated with YOKOHAMA. Under the theme of "harmonize the pleasure of driving with the environment" and "the research and development of EV tires", YOKOHAMA has continued to promote EV technological development. In addition to its many years of supporting various EV races and events, YOKOHAMA has participated in "Pikes Peak International Hill Climb" a world-famous hill-climb race with EV racing cars and broke the EV-class world speed records for 3 straight years from 2010. Aerodynamic drag reduction on vehicles With YOKOHAMA’s proprietary tire aerodynamic technology, dimples are employed for the tire side that becomes outer surface when mounted on a car, and fin-shaped protuberances for the tire side that becomes inner surface. While the dimples help reduce aerodynamic drag on the tire, the fins generate air flow that pushes the car forward by increasing the air pressure in the front side of a wheel wells, thus making it possible to contribute to fuel efficiency improvement by reducing aerodynamic drag on vehicles. Employment of prepreg* for ultra-lightweight, high-strength CFRP By utilizing technologies cultivated through developing structural materials and lavatory modules for passenger aircrafts, YOKOHAMA employed the prepreg for CFRP (Carbon Fiber Reinforced Plastics) certified by the world’s largest aircraft maker for the first time in Japan for the whole body of the "AERO-Y" after dedicated tuning. With its ultra-light weight regardless of high strength and durability, the CFRP contributes to longer service life of the EV battery. High adhesive technology for different-type materials including metal and resin EVs are expected to employ more resin materials because of resolved thermal problem in internal combustion engines and body frame structures using aluminum and resin materials for lighter weight. In order to combine these different-type materials, an adhesive capable of replacing welding is essential. YOKOHAMA has therefore employed the HAMATITE technology with outstanding achievements in wide-ranging applications encompassing from automobiles to construction.